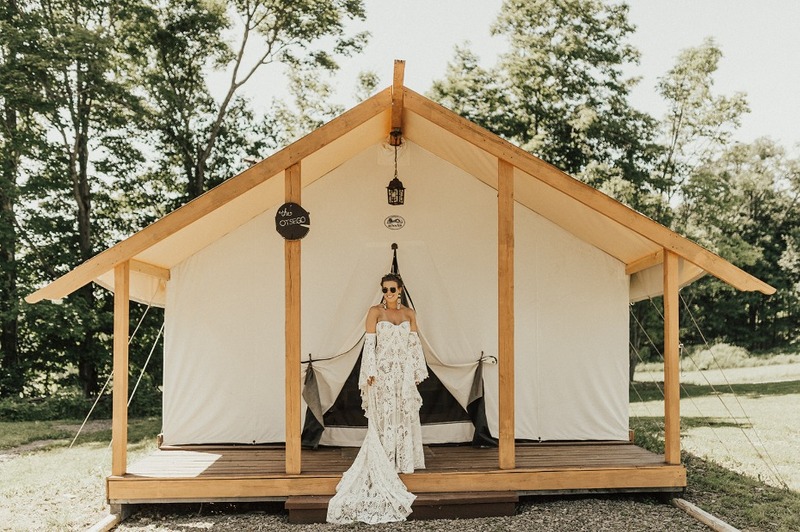 For the last however many years, we’ve been hearing about wedding weekends in the woods, with the word ‘glamping’ thrown around pretty generously. And sure, we’ve entertained the idea, but only really because we’re a bit tent / teepee crazy. In actuality, thinking about a wedding in a milking parlor, followed by pre-hangover sleep in even the coziest tent makes us cringe a little. 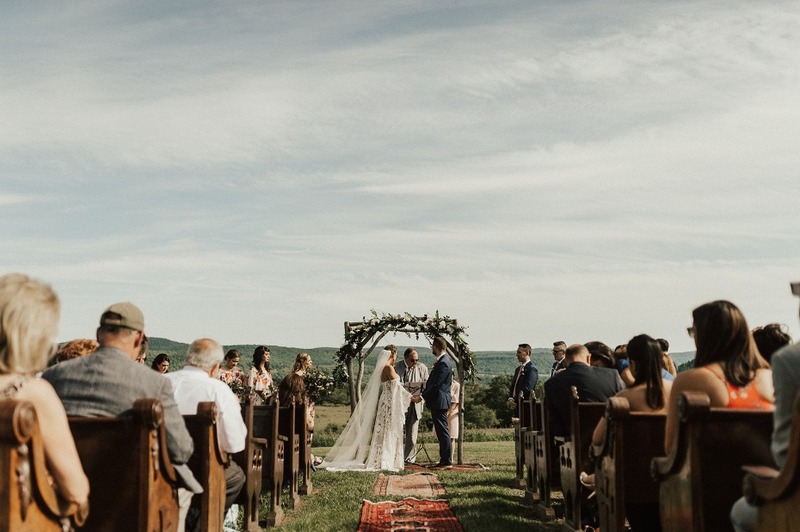 But Gilbertsville Farmhouse, a hidden oasis in the hills of central New York and the area’s ONLY glamping wedding venue, totally changed our minds. It’s seriously a best kept secret for an ‘off the beaten path’ kind of couple, and in catering to only 22 soon-to-be-married pairs per year, the venue can truly ensure a beautiful, intimate, and super unique weekend wedding experience for all. Sharon and Aldo, the owners of the farm, are living, breathing believers in #somethingborrowed - and from Friday to Sunday, they open their home to their couples and their loved ones. Of course, as a husband and wife team, Sharon and Aldo have had plenty of their own relationship and family firsts, but when it comes to their barn baby, they’ve shared a lot, too! We could probably just direct you to their weekend wedding info, and call it a day, but where’s the fun in that? No, instead, we’ll give you an abbreviated version, that still speaks volumes about the magic of this space. There are goats that do yoga. There’s an alpaca who thinks she single-handedly made flower crowns a trend. There are kittens who occasionally get adopted by guests, and a French sheep (named Pepe) who’s as small as a chihuahua. 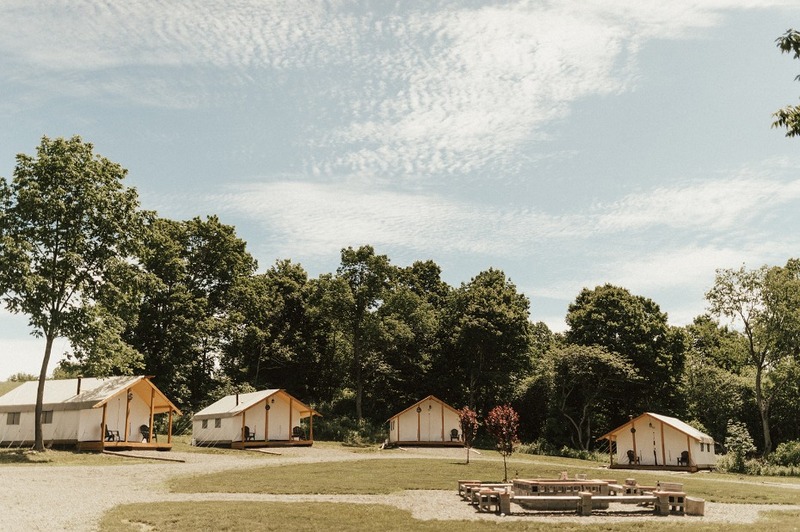 There’s a village of gorgeous glamping tents that takes you far away from stress, pressure, anxiety that can so easily cloud a wedding day and precede it in the planning process. But couples who book with Gilbertsville get out of it all, because they have Sharon+Co. on their side with all the preparations and Aldo’s s’mores to look forward to at the end of it. Yes, there will be a wedding, an unbelievably gorgeous one, overlooking the Catskill Mountains.. NBD. But the beauty of the weekend comes from everything else, before and after, and the joy of knowing that your favorite people in life will be there for it all. So, be ready to play some volleyball with your bridal party when everyone arrives on Friday (guys versus girls, perhaps? ), enjoy a rehearsal dinner under the stars with your squad, and bundle up for a backyard movie (maybe even with some spiked cider or cocoa?) before hitting the hay (not literally 😉). 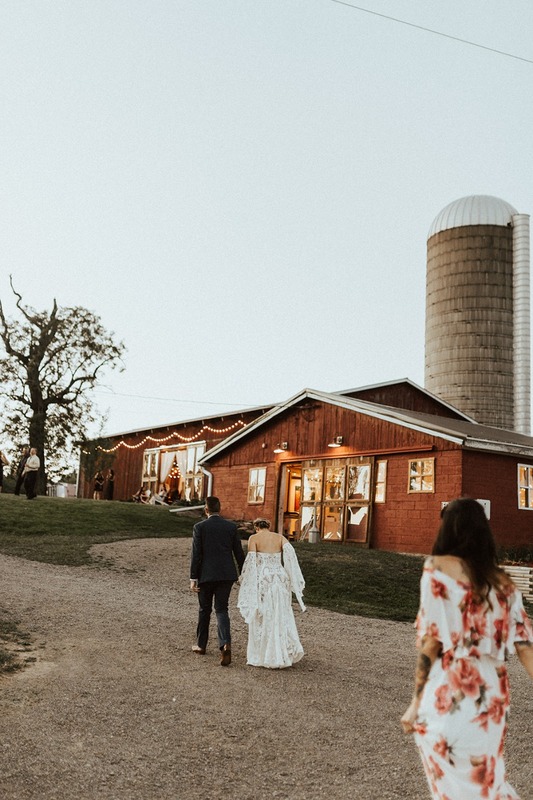 You can celebrate your newly-hubby or wifed-up status with all of your nearest and dearest in the Wedding Barn - which is honestly one of the most incredible sights we’ve ever seen in the wedding+event space - and end the evening with a glowing bonfire. So lit. We can’t even. Really, though, Sharon can you adopt us? There is a palpable sense of togetherness at the farm. It is a family-run business with Sharon, Aldo, and their four children at the helm, plus a hugely close-knit staff on-site that really loves what they do. Sunday after Sunday, the fam says goodbye to their couples, sending them off to a wonderful future ahead, knowing that their family has grown by a couple every time. And for the couples, the good vibes aren’t just reserved for the wedding day (we mentioned that, right?). Gilbertsville hosts most of their couples’ families and bridal parties on-site, giving them a sense of closeness for the weekend. The farmhouse is booked privately and exclusively, allowing brides and grooms and their VIPs to spread out and relax. Oh! And the venue doesn’t offer catering, which is actually quite the blessing because it allows each wedding to fit each couple’s unique vision. They’ve had food truck weddings, trailer-oven pizza parties, and wonderfully-catered affairs serving up all sorts of culinary goodness. Sooo, yah, glamping weddings have our green light - for sure!!!! Reach out now to inquire about 2020 weddings. 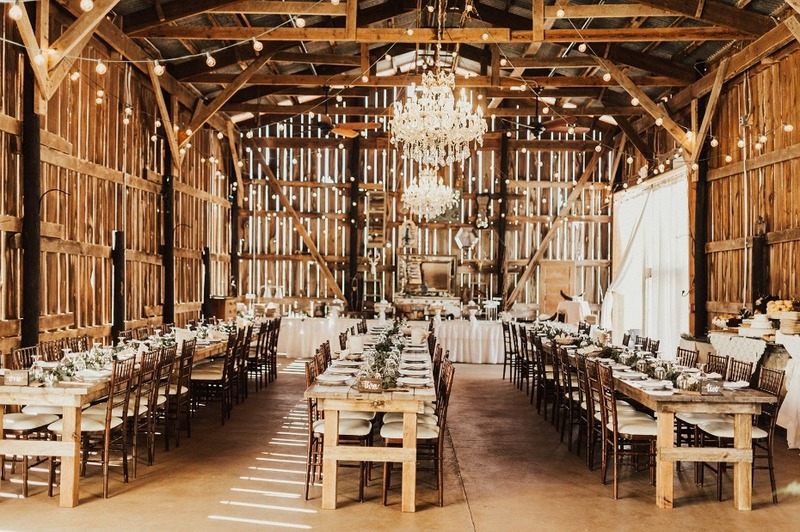 We partnered with Gilbertsville Farmhouse to share this beautiful barn+beyond with you. As always, thank you for supporting our sponsors!